What property and perils are excluded from my policy? Typically, coverage does not apply to damage caused by flood, surface water, water that backs up through sewers or drains, earth movement, nuclear damage, war, etc. Personal liability and medical payments do not apply to the operation, ownership, use, etc., of any aircraft, automobile, RV, water craft powered by more than 50 horsepower motor; bodily injury or physical damage caused by an intentional act of the insured. How do I collect for my personal property? If my sump pump fails due to water backing up through the sewers, am I covered? No, but you can easily add a sewer and backup endorsement to your homeowners policy to cover the loss. Theft to watercraft, including furnishings, equipment and outboard motors, is typically excluded if the theft occurs outside your residential premises. To cover your boat and its accessories, you need a separate boatowners insurance policy. I have insured antique items listed on my policy. If I have a total loss, do I receive payment for the full insured value? We will first confirm the value of the items with one or more independent antique dealers. You should then be paid a dollar value based on the dealer(s) estimate of the worth of the antique items. The best way to insure your antiques? Get appraisals and establish the stated values in the policy. During a storm, a tree from my neighbor’s yard fell and destroyed my fence. Who pays for the loss? Generally, your own policy should cover the loss. The carrier may be able to recover the amount paid for the loss from the neighbor’s homeowners insurance if the loss occurred as a result of your neighbor’s negligence. Why does the insurance company want to know what kind of dog I have? According to the Centers for Disease Control and Prevention (CDC), approximately 4.7 million people are bitten by dogs every year, and about 800,000 of those bites require medical care. Accidents involving dog bites cost the insurance industry over $1 billion per year, and are now the largest cause of homeowners insurance claims in the United States. As a result, many breeds are considered “uninsurable” or may require increased premiums. How much coverage do I need? Ask yourself how much damage could you cause? Think worse-case scenarios: a young mother is paralyzed or killed by a falling tree limb on your property or while helping you with a DIY remodeling project. Large claims happen more often than you think. Even if you do everything right, there is a possibility that you could be sued for several millions. Yes! A Personal Umbrella is an affordable way to extend additional liability limits should you exhaust your underlying home or auto liability limits. Make sure your umbrella includes uninsured/underinsured motorists liability. My house is held in a trust or LLC. How do I cover it? If any of your property is not owned in your name, discuss the details with your agent to make sure the policy is set up properly. There could be significant gaps in coverage if the policy is set up in your name but owned by a trust or LLC. I’m considering remodeling part or all of my home – will this affect my insurance? Experts estimate that one-fourth of remodeling projects add at least 25 percent to the value of a home, yet most homeowners forget to increase their coverage to protect their investment. Most homeowners insurance policies require 100 percent of the home’s replacement cost, so it’s important to raise your home’s policy limit before your project begins. If you’re working with a General Contractor, request a Certificate of Insurance for their Workers Comp and General Liability Insurance. DIY’ers – beware that you may be personally liable for friends or relatives that are injured while helping out as a favor to you. Does my homeowners policy provide coverage if we rent our home through Airbnb? If a renter uses your home for even a small amount of time, you and your family will be exposed to significantly different risks that weren’t considered when your policy was written. If you’re considering renting through Airbnb, your first step should be to contact your insurance agent to review your current homeowners or renters insurance policy. I am considering purchasing a second home – do I have to buy another homeowners policy? Since most homeowner policies require occupancy as a condition of insurance, the fact that you visit infrequently may preclude you from obtaining full homeowners coverage. Dwelling fire insurance is an alternate coverage option used to insure residential rental or non-owner occupancy property, including vacant property. A dwelling fire policy continues to offer coverage for a home and other structures (e.g., detached sheds or garages) for perils named in the policy. For more coverage, consider adding personal property protection and liability insurance to a dwelling fire policy. I am considering purchasing a rental/investment home – what is the best way to insure it? If you don’t live in the home or on the property, a dwelling fire policy will cover the building and other structures, but not the personal contents property inside. Make sure your renters understand that you are not responsible for their belongings or personal liability, and that they should purchase a renters policy to protect themselves against any losses. A complete review of your policy is the only way to determine what property is covered and what perils are insured against. We can help you identify your risks and explain what’s included in a homeowners insurance policy, including the standard limits of coverage on property insured such as money, watercraft, theft of jewelry, silverware and guns. I just bought my house for $305,000 – why is the insured dwelling amount $421,000? When your home is insured for replacement cost, it needs to be insured at the amount it would take to rebuild your home with like kind and quality materials. Market value does not come into play – instead, it is a reconstruction value considering the size, materials, and features of your home, such as the type of flooring, number of bathrooms, etc. Does my homeowner’s policy protect my home-based business? Homeowners policies are designed to cover personal exposures. You might be able to add an endorsement to add some coverage for business exposures, but your best bet is going to be an in-home business policy or business owners policy. How can I save on homeowners premiums? Consider raising your deductible, invest in a home security system, update exterior locks to dead bolts, install smoke alarms, select an automatic payment method, monitor your credit rating, or ask about multi-policy discounts. Download our FREE Homeowners FAQ! 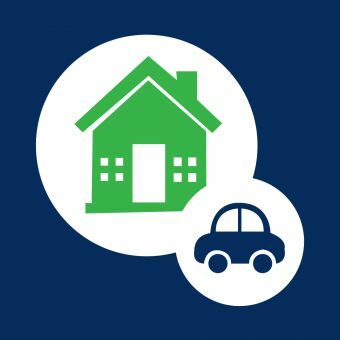 Download our Home & Auto Quote Request Form!